In every generation a few definitive voices present themselves, with a unique sound and soulful appeal. Dubbed “The new Golden Voice”, Jah Van I’s first single on Royal Warriors Muzik label, “In My World”, debuted at number 4 on the widely acclaimed Stampede Street Charts, in Jamaica. Since then Jah Van I has appeared on several popular Jamaican television and cable stations, CVM TV, Hype TV and RE TV. His music has received rotation internationally on stations such as Indie in Motion (Los Angeles), KMT (Martinique), Hits 92, Irie FM, ZIP FM, Fame 95 (Jamaica) and RJR London (UK). 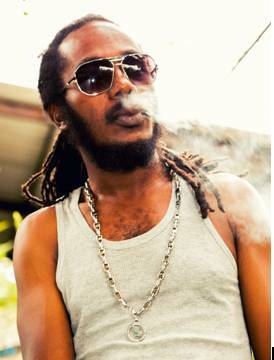 Jah Van I has also shared stages with renowned artistes, George Nooks, Beenie Man, Mavado and Fantan Mojah on shows such as Camp Fire. Born Vanern Dwayne Tulloch, in the parish of St. Catherine and raised in Portmore and Old Harbour, Jah Van I attended Davis Basic School and Bridgeport Primary. He later studied at Knox College. Whilst working as a ramp attendant for Air Jamaica, his colleagues noticed he wouldn’t stop singing. They encouraged him to pursue music professionally. Jah Van I made his first professional recording in 1999, a single entitled “Pictures Frame” for producer Chris Knight. In 2010 he encountered Bhyrr (owner/ founder of Royal Warriors Muzik) at Anchor Recording Studio. The following year Royal Warriors Muzik signed Jah Van I. Currently Jah Van I and Royal Warriors Muzik are hot on the campaign trail for his debut album “In My World”. Full of conscious lyrics, “In My World”, addresses topics such as love, social, political and economical issues. One such conscious track is entitled “Down a Yard”, a song which speaks about Jamaicans wanting to go to foreign in pursuit of a better life. According to Jah Van I, who has travelled overseas and developed fan bases in islands such as Martinique, “Nobody wants to stay a yard anymore, but there is no where like yard”.... “Nough tings a gwaan. No love no whey like yard”. Other explosive singles from the 12 track album includes “Reggae Music”, “Home Alone” and “Hello Suzy”, a love song. “In My World”, is currently available on . To follow the latest developments on Jah Van I’s career visit Royal Warriors Muzik Group on Facebook.